We continue to splutter. Both struggling to create chances and take the few that come our way. At least there wasn’t a major goalkeeping rick against Chesterfield, and at least we didn’t lose another game. It’s very early in the season to be too concerned about anything at the moment, a couple of victories or defeats can easily change the way we view performances. Against Chesterfield for example, had McNulty taken one of the several chances he had, we would be talking about a solid away win rather than a concerning draw against bottom of the division (who, as if to highlight the futility of league positions this earlier in the season, then moved out of the bottom two as a result of that draw). I seem to remember Mark Robins making a similarly slow start to his first spell in charge of the club before things all of a sudden fell into place. The issue for Mark Robins at the moment is clearly how to form a fluent attacking unit out of the options available. Individually, we have some useful attacking players, but they are yet to demonstrate that they can function as a team-unit. The hope is that our defensive solidity will continue to hold out and eventually things will click into gear up front and we’ll become a ruthlessly efficient winning unit – a la that team Robins put together in his first spell. 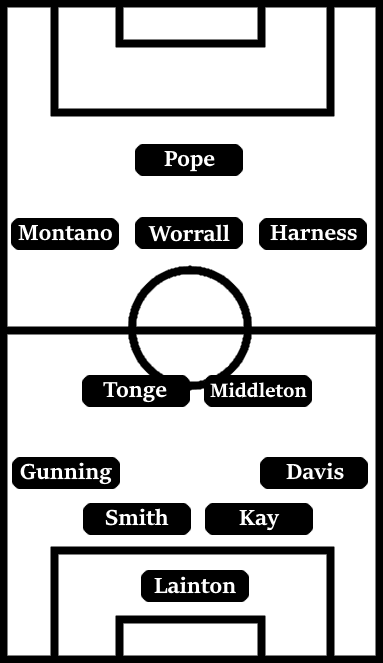 As for the team selection for this meeting with Port Vale, the back five looks pretty much settled, although if Rod McDonald is back from injury, he’ll replace Tom Davies in central defence. Robins also appears set on having Michael Doyle and Liam Kelly as the central midfield partnership, so that will stay in place. Jodi Jones is the only direct runner in our attack, so he’ll stay in place. McNulty is the only out-and-out ‘goalscorer’ in the side, so he’ll stay in place. Essentially Robins has left himself with a selection between either Tony Andreu or Stuart Beavon to play in just behind McNulty, and either Duckens Nazon or Peter Vincenti out wide. 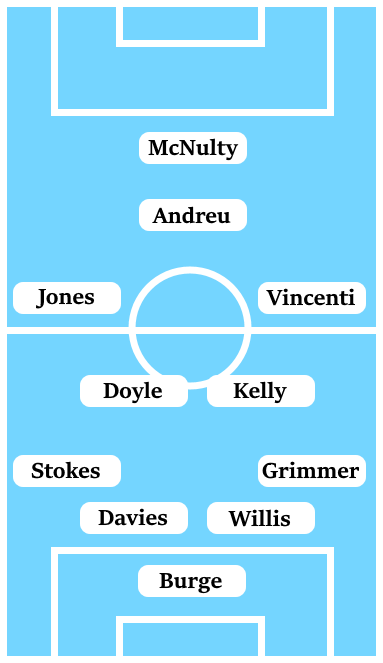 Personally, I think we’d look better with Nazon playing in behind McNulty, although there is an issue of who is there to hold the ball up, and with Andreu playing in a deeper central position instead of one of Kelly or Doyle. However, Robins is a pragmatic manager, so I don’t think the starting XI for this game is going to be as risky as the one I’d like to see. Confidence was at an all-time low heading into our last clash with Port Vale, back in March of this year. Mark Robins’ return to the club had failed to deliver an impact and relegation looked set to be confirmed within weeks. Somehow though, we produced a really composed performance, buoyed by two fantastic goals – first, a speculative 30-yard lob from Kyel Reid, second, an impudent backheel from Kwame Thomas – we cruised to victory, despite a subdued Port Vale mustering a late goal. Port Vale were relegated alongside us at the end of last season, admirably taking things until the final day of the campaign and drawing 0-0 with promotion-challengers Fleetwood Town. Their relegation was largely the result of a failed gamble on a largely foreign squad and manager with little experience of English football and manager Michael Brown – who took over as caretaker back in December – has had to spend the summer building an almost entirely new squad. While Brown has been put in a difficult position, his squad-building over the summer has been more than a little chaotic, leaving a fairly unbalanced squad. There are currently six wingers on the books, but just three central midfielders, additionally, they lined up with a back four comprised entirely of centre-backs in their most recent game. The, quite literally, biggest player to look out for in the Port Vale side will be club stalwart Tom Pope in attack. A classic lower-league target man, Pope’s physicality and ability to hold the ball up has been a key part of Port Vale’s play this season, complementing the pace they have due to the sheer number of wingers in their squad. Of those wingers, Cristian Montano could prove the biggest thorn in our side due to the combination of pace and end product he demonstrated at this level with Bristol Rovers two seasons ago. In addition, Ben Whitfield, on loan from Bournemouth, has really caught the eye this season with his technical skill, while Marcus Harness, a Coventry-born Burton loanee, has looked both quick and industrious thus far. Elsewhere, Nathan Smith in defence is someone who clearly shouldn’t be playing in League Two. Not the tallest or even the quickest of defenders, but Smith is an incredibly composed customer with excellent positioning who often carries the impression of being able to deal with opponents without breaking a sweat. He’ll be alongside the experienced Antony Kay as a central defensive partnership. Another key player for Michael Brown’s Port Vale side is Brown’s former midfield colleague at Sheffield United and Leeds, Michael Tonge. The vastly experienced playmaker impressed in the early weeks of the season with his set-piece deliveries proving to be a key element in their opening day win over Crawley Town and as part of an ill-fated comeback against Wycombe the week later. This game should really be seen as an opportunity to kick-start our season after our recent poor run. Port Vale’s are a side similarly struggling to create chances as we are, and you would hope that would allow Robins and the players to be more proactive in taking the game to the opposition. However, there is pressure from the stands for us to go out and win this game, and in a fairly convincing manner – Port Vale don’t have the same pressure, despite their own poor start. I’ll think we’ll come away with a win, but it won’t be a pretty game of football. 1-0 to the Sky Blues.